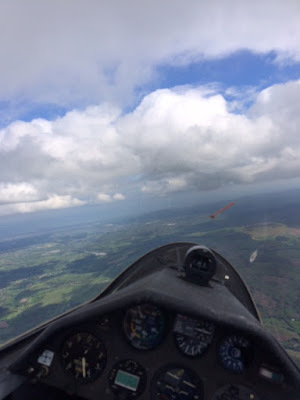 Flying today was a challenge in persistence. Looking out first thing revealed mist and fog. 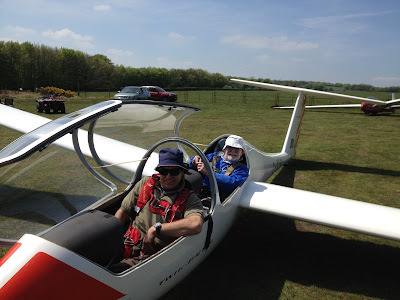 Challenge 1 but off to the airfield anyway. Arriving at the airfield it was obvious that there had just been a very, very heavy shower; the water rushing off the site via the gate looked more like white water canoeing would be the order of the day. Challenge 2. The weather would be better soon ( wouldn't it ?? ). Challenge 3 was to reassemble K13 G-CHXP after the servicing carried out last Wednesday. 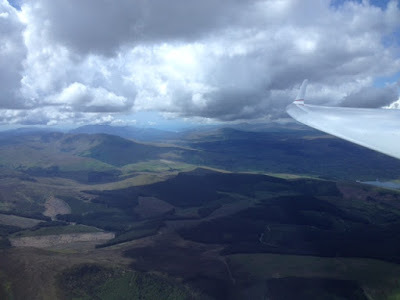 A now Challenge 4; wait for the the mist a low cloud to improve enough to permit some flying. By 1pm we were off. After an initial test flight of HXP, first up was our Junior Visitor Jack Simmonds from Saltash who has patiently waited all morning with his parents for his chance to fly. 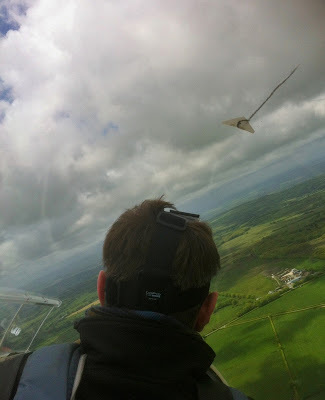 Jack had 2 flights with IFP Fred Marks and later had a further flight with me. Fred also flew our other visitor, Ben Rymer. By 4pm there were even signs of thermal activity. Best flight of the day was by Ged and Phil in the Twin Astir who managed to stay aloft for 20 minutes to lead a pack of other soaring flights. Just before 6pm the cloudbase was lowing once more so it was time to return the aircraft to the hangar and retire to the clubhouse for tea and madals. We had completed 23 flights. Not bad for such a late start. 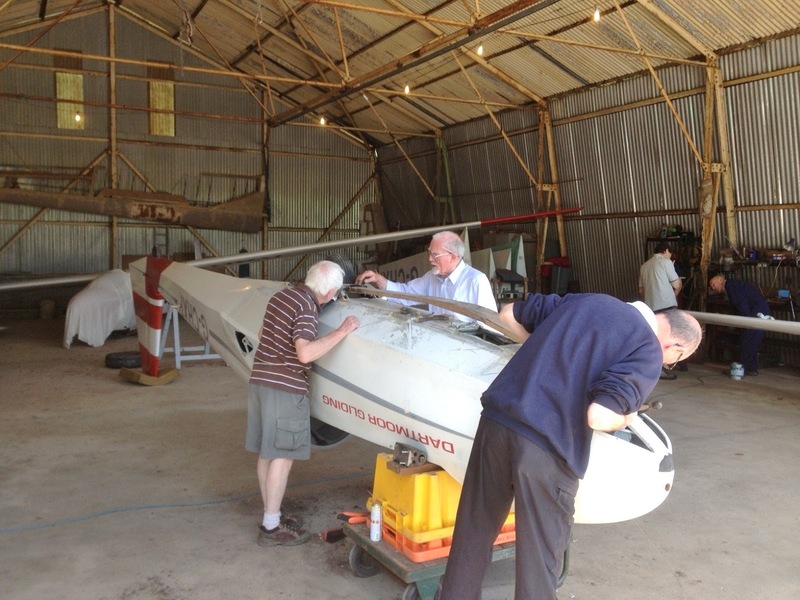 Thanks to all those who helped and to everyone for maintain the pateince which ultimately made flying possible. K13 G-DDMX has been taken off line for it's annual inspection and ARC. 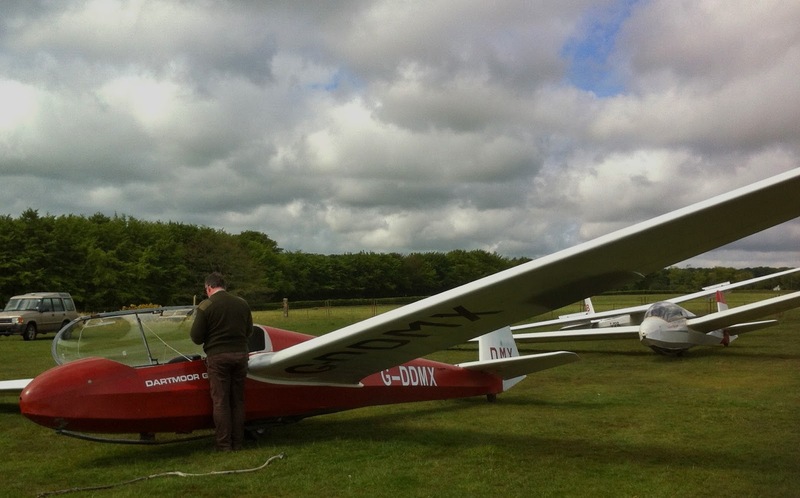 Unfortunately K13 G-CHXP ran across the track on Sunday and damaged it's front skid. 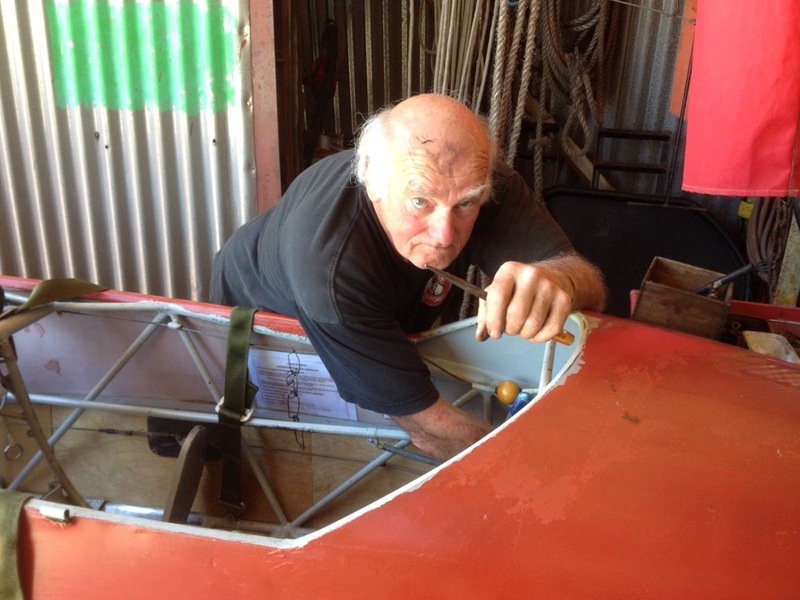 So it was all hands to the pump today to get both k13s airworthy again. 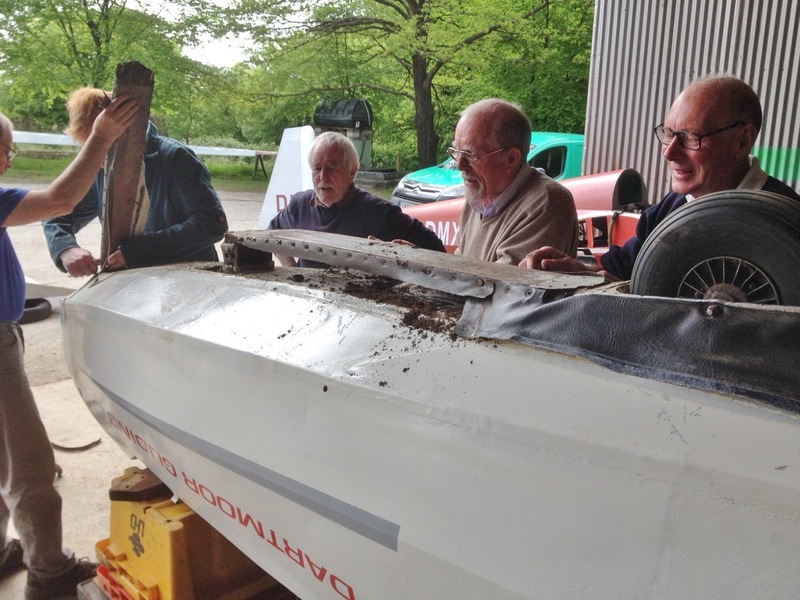 One team helping Colin on DMX whilst the others worked on replacing the damaged skid on HXP. Having de rigged HXP we turned the fuselage upside down, and took out quote a few kilos of earth before removing and replacing the skid, a fairly lengthy task involving lots of wood work and metal work, replacing fabric and vinyl and a lot of elbow grease! Once derigged it took us about 7 hours to replace it and the fabric skirt. 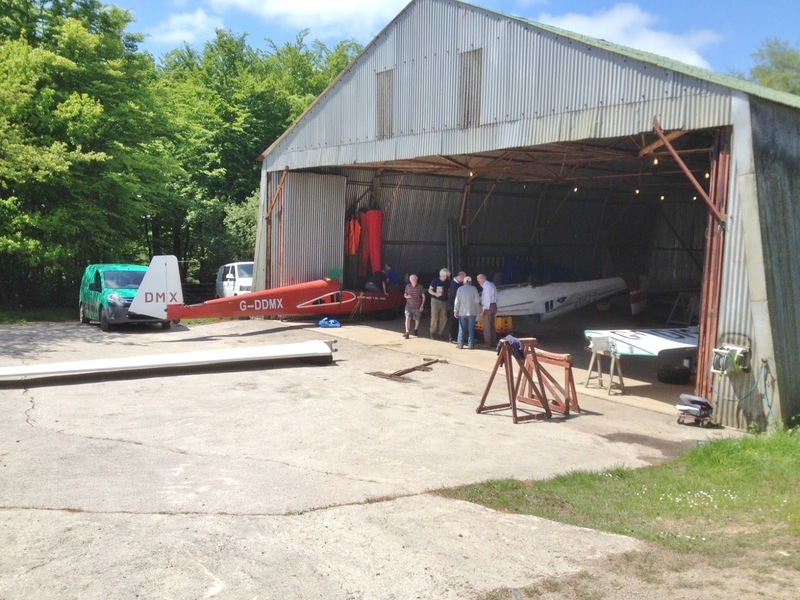 Where would we be without the hangar? Bits of aircraft everywhere. It was a hot day and lots of sweat and toil. Only Barry managed to get airborne in his powered glider but there were no thermals. Heather kept everyone refreshed with copious amounts of tea. The less said about this view the better. Thanks to everyone for all their help today. 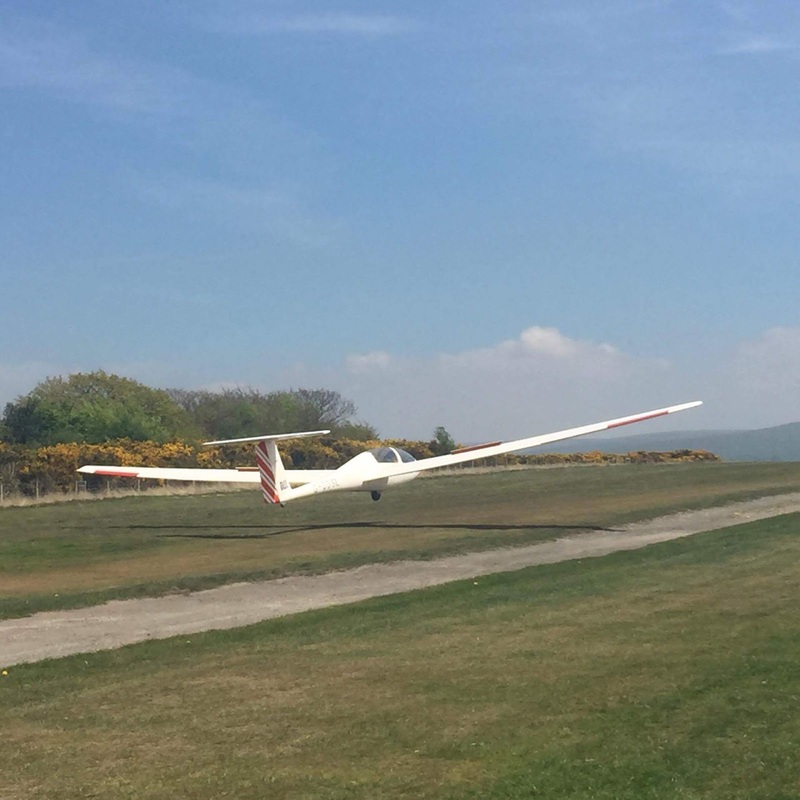 Most gliding clubs adapt and print their pre-solo training cards to meet their own needs. They all containing a list of exercises that must be completed before the trainee can be considered ready for solo flight, and most call them to have flown a ‘Crosswind Circuit’. I don’t know on which club’s cards our training cards were based, but it strikes me that a lot of time, ink, dating and signatures could have been saved if we’d had them printed with a ‘√’ in the ‘Crosswind Circuit’ box, as crosswinds seem to be the norm at Brentor. 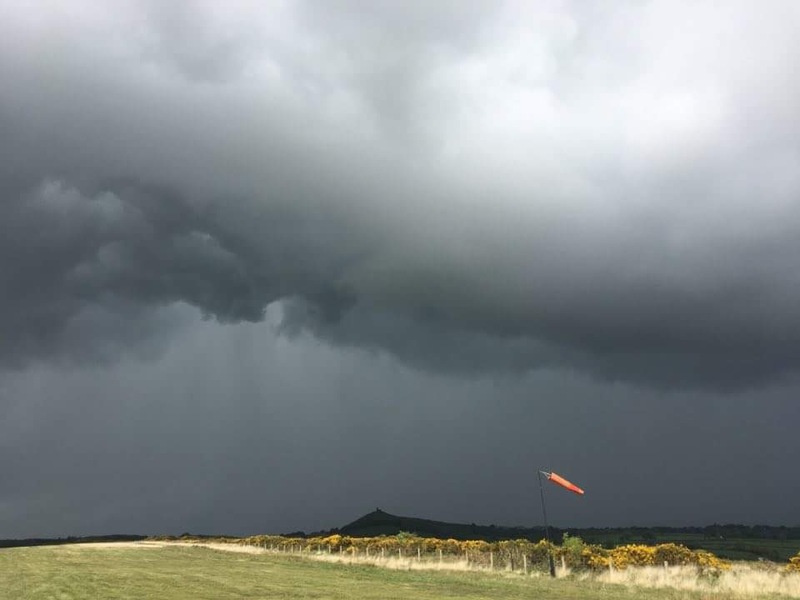 Today was a case in point, with the wind blowing up from the south across our W-E runway all day (well, until early evening when it mysteriously backed to the east…). Blowing at strengths between 12-18kts., the wind provided an interesting challenge, particularly on the downwind leg and final approach, that fully met the ‘Crosswind Circuit’ criteria. 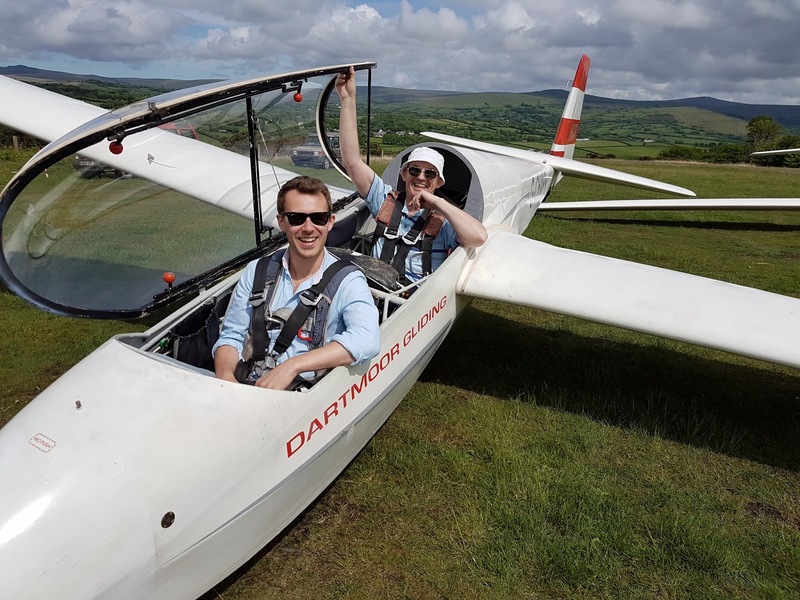 We were very pleased to welcome the White family as our visitors this morning: the Whites (Paul, Beth and Dad Ken) from Saltash, flew with Roger Appleboom in K-13 HXP (see photos). 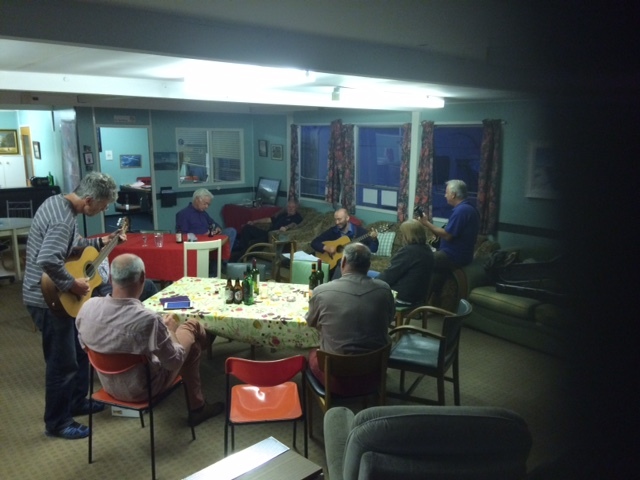 In the afternoon we were joined by Matthew Ash (however sadly no photo to record the event). 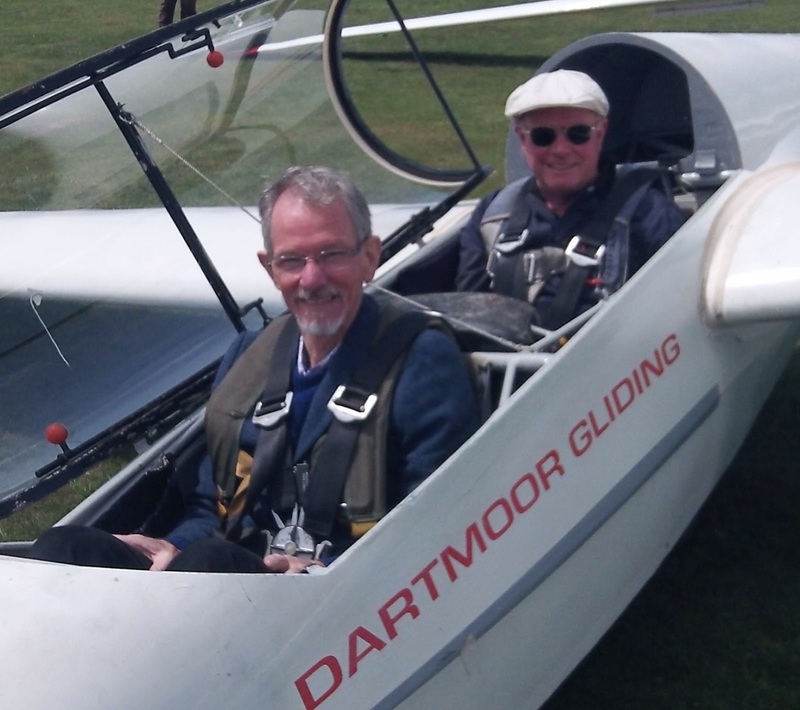 Visitor Paul White, from Saltash, who flew with Roger Appleboom in K-13 HXP. Paul’s sister Beth, from Plympton, also flew with Roger. Paul’s father, Ken, completed the White trio. 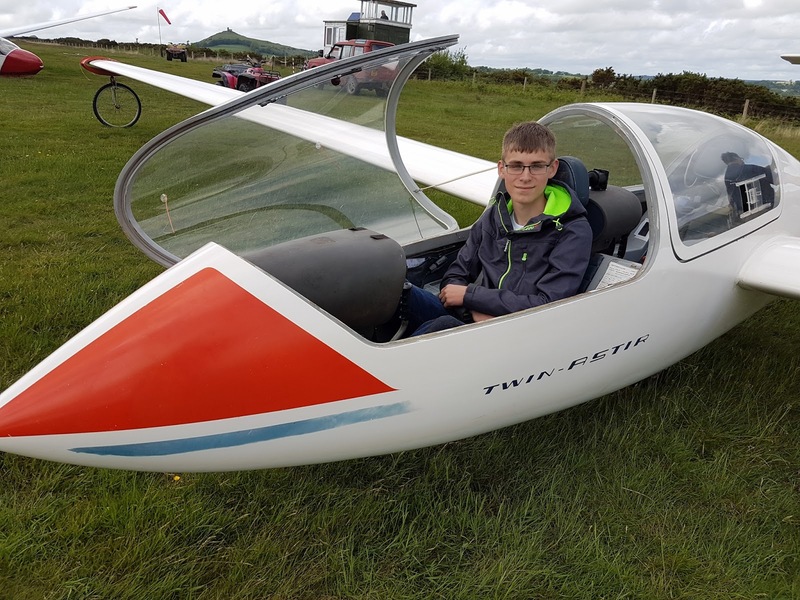 The air was surprisingly buoyant from early on, allowing trainee David Westcott to get to 2,300ft and experience two demonstration spins, in less than 17 mins – now that’s good value! And, as the afternoon progressed, well defined streets of cumulus established themselves in a SE-NW orientation, one starting from well beyond Dartmoor, possibly Kingsbridge or Start Point. Step up Allan Holland who, alone among our solo pilot cadre, was up to handling the K-8 in the crosswind, and managed a cool 1 hr 17 mins (or more according to Allan’s watch) using the streets upwind of the site. 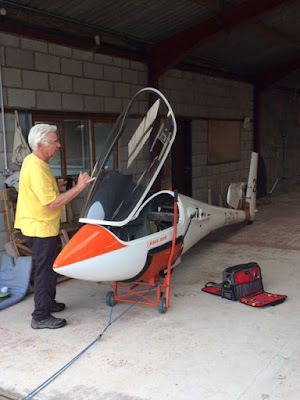 Allan Holland about to set off on a 1hr+ saunter in the K-8. 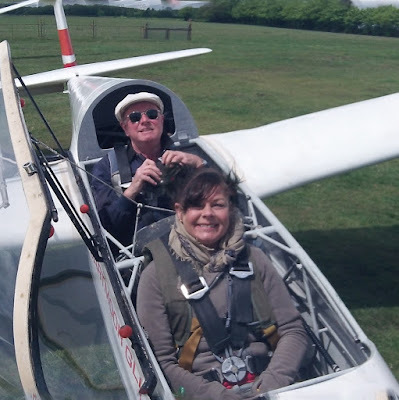 Other trainees included Tony Dean (check flights ticked ‘C’…), Chris Owen (on top form since deciding to leave the ‘Sunday Times at home..! 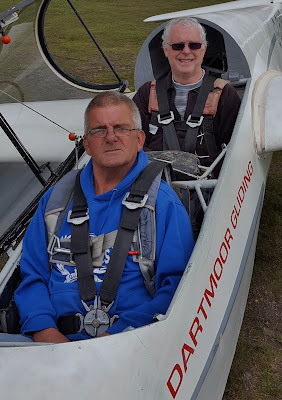 ), Joe Nobbs (20 mins two-seat soaring, well done Joe), Phil Selwood (welcome to the world of launch failures) and ex-Bush pilot John Knight, who happily continues his transition from power to wood, today with two soaring flights, one of 21 mins. 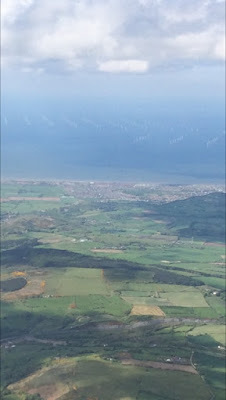 As the afternoon drew on the wind, as mentioned above, developed a more easterly tinge and, as the cloud streets began to decay, the lift remained strong at certain geographical points (as John Knight will tell you) as in the K-13 the audio varios screeched to be set free from their instrument panels as we turned onto base leg… Could that have been wave? 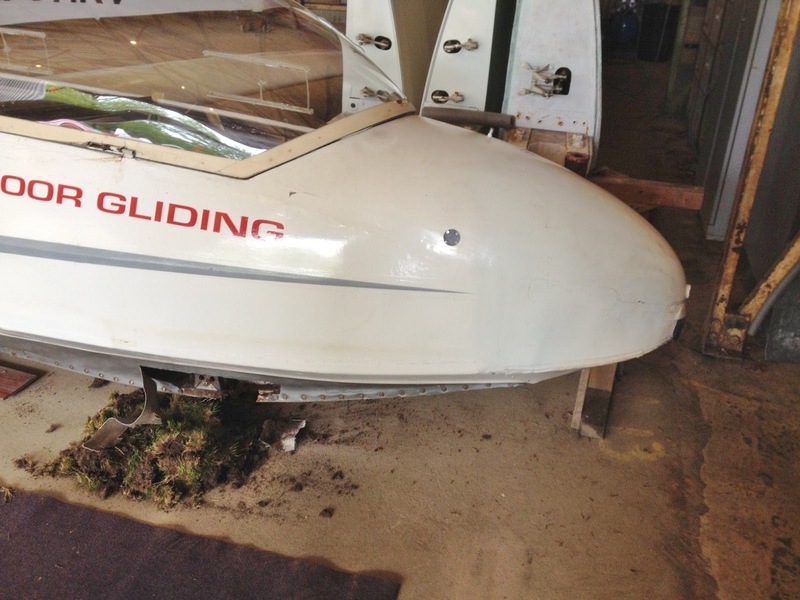 A couple of decent single-seaters could have helped pursue some interesting investigations. 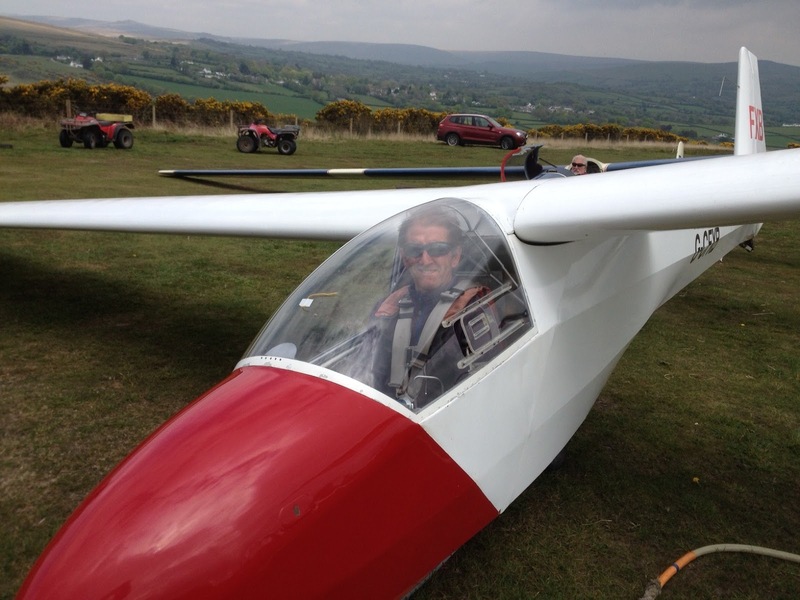 New trainee John Knight soaring (for 21 mins) in K-13 DMX. Thanks most sincerely go to Dave Downton for winching, skilfully, almost all day, and to Allan Holland for relieving him, to the retrieve crew and to those on the quad bikes who arrived within seconds of each landing to tow the gliders back to the launchpoint. A testing, tantalising, and rewarding day. Today was going to be a difficult day. The forecast showed frequent showers, as did the weather radar apps which seem to be on everyone's phone these days. 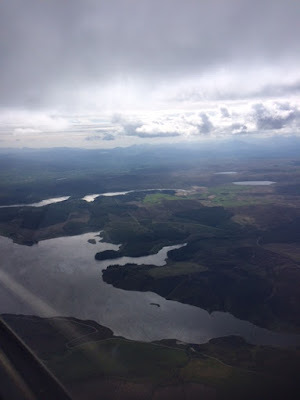 There was, however, a steely determination to fly. And so, we did. The day seemed to be a continuous procedure as follows. 2. 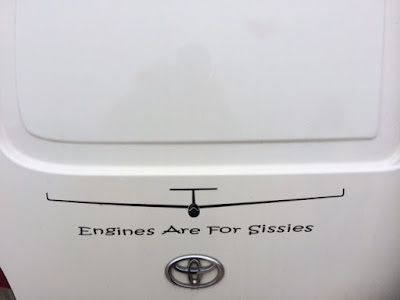 Quickly dry the gliders off. Step3. K13 G-CHXP takes off into a glowering sky. 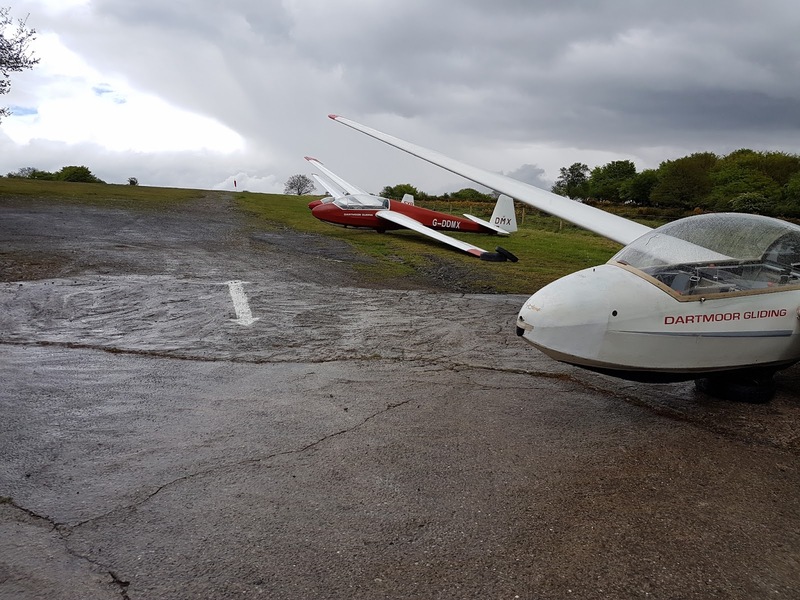 Between the showers, the flying conditions were ok for the most part but care was needed with the variable (mostly southerly) winds which strengthened considerable with the gusts associated with the oncoming showers. 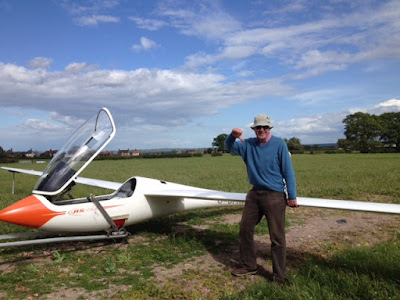 Flight of the day goes to Stephen Fletcher who managed a dizzying 7 minutes in the K8. There was a good number of useful training flights. Our visitor today was Peter Chamley from Hayle who showed great patience waiting with us for the gaps in the showers. 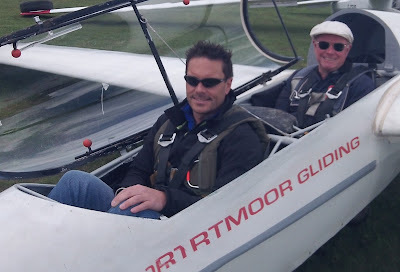 Peter had a couple of flights with me and will return in the near future to complete his flying experience. 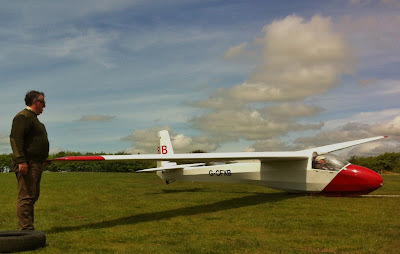 Peter Chamley waiting to fly with me. We made the best of the day. Dartmoor Gliding Society seems to be spreading it's wings as we have all seen over the last few years. This is a great thing for DGS. 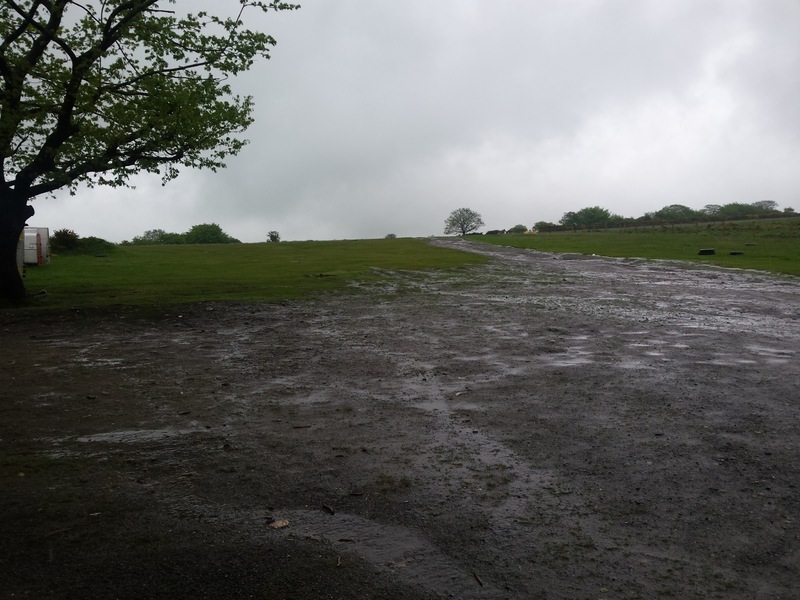 and it now includes regular trips to Long Mynd, the Inter Club League at four of our neighbouring clubs, as well as the Aston Down trips when specific training needs are required. With this in mind I was trawling the adverts on Gliderpilot.net (as is my want on occasions) when I found an advert for a soaring/training week at Denbigh GC (north wales). I made the enquiry and booked a place. I was told numbers were very limited due to the fact it was being run by G Dale. 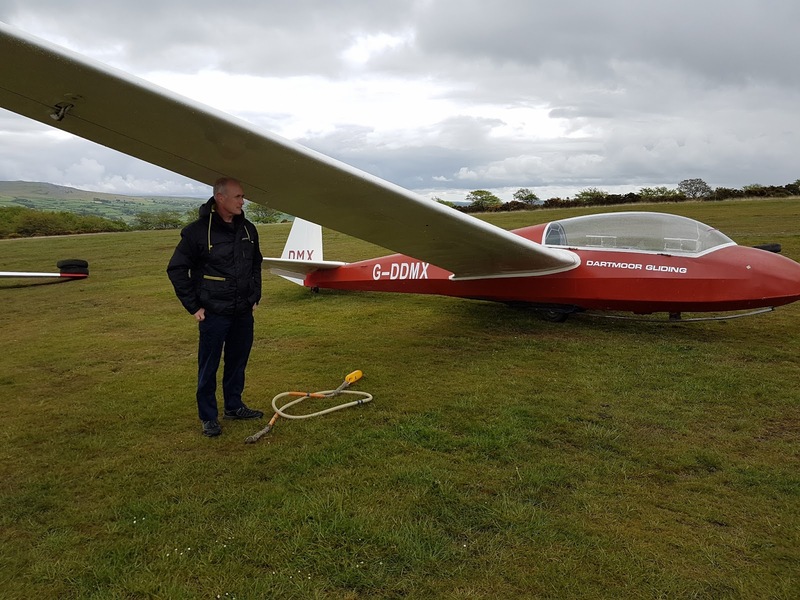 (ex national coach and competition pilot with over 10,000hrs).The places were filling up fast and I mentioned to a few people at Dartmoor I had got a place. The down side was it was being run at an expedition site (not a training site) this has a requirement of sliver C and self authorising. 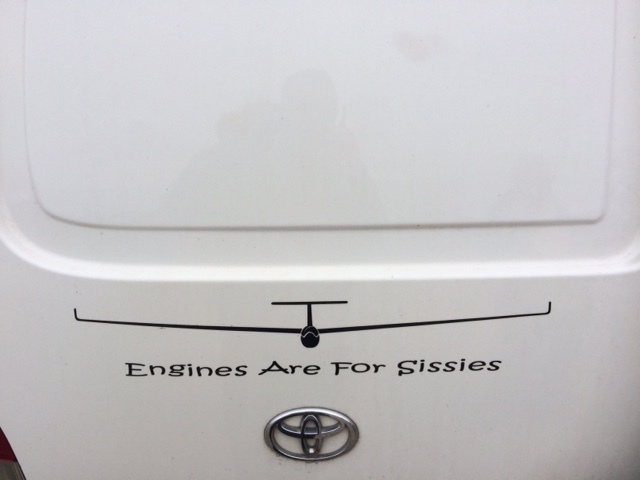 It doesn't have club gliders to borrow or fly. 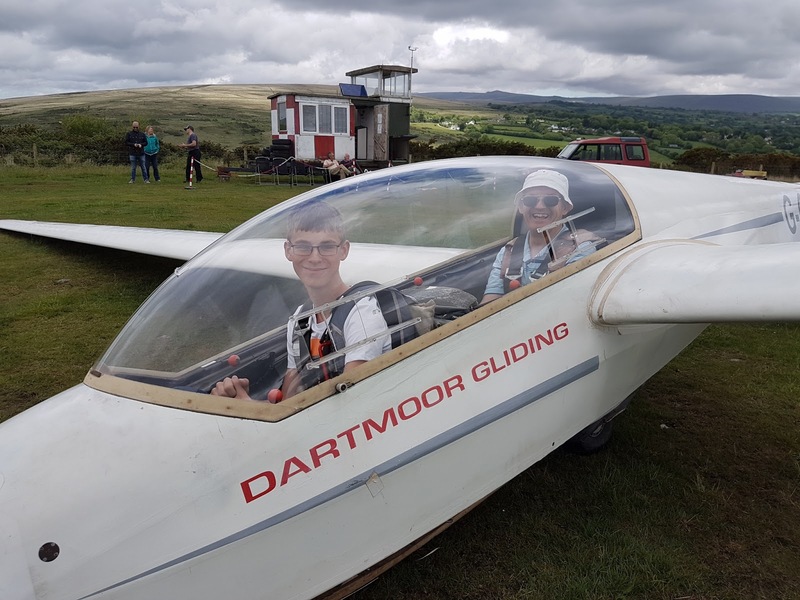 Well, over the space of the next week Dartmoor pilots took 36.6% of the 11 total on the course. So Roger G and I elected to leave on the Saturday and tow the 5H30min to site , arriving at 2pm ish. 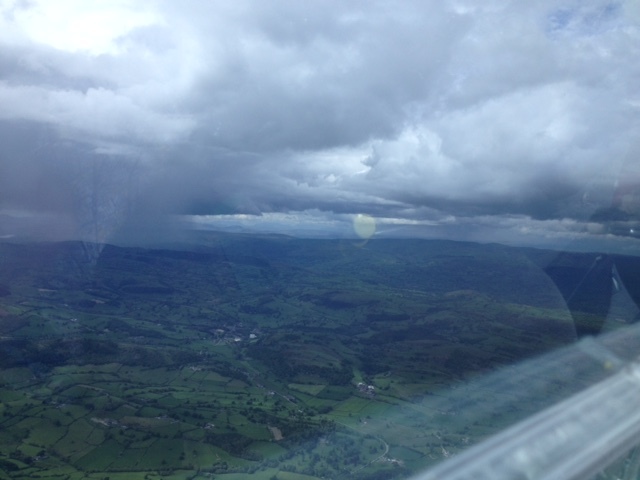 We both took different routes, I went up to nearly Warrington and then turned left across the top of Wales. Bearing in mind, I was 20min behind Roger G, it was a great surprise to me he didn't arrive till about 30min after me. Here starts a reoccurring theme of the week. We arrived early and it seemed half the course had the same idea. We had arrived early to get the accommodation sorted and get to know the systems and places in the area, but, Chris Gill the operations manager had other ideas...."its good weather and the wind is on the ridge, suggest you rig and get on ridge to get your bearings, I will get the winch out as tug not here yet." So we watched how it was done Off went the Arcus T and straight off the launch they pulled out the turbo and powered up to top of ridge height and disappeared... mmm but we don't have a turbo?? So my go.... wouldn't you know , straight off the winch I contacted 1.5knots up, so took the easy option and stuck with it. Thank God. 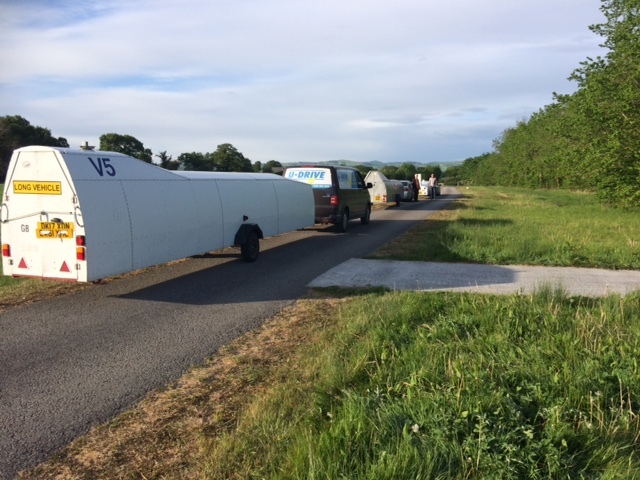 Roger A and Adrian arrived, Roger A had a space behind his van where a glider should be when arriving on a soaring course. 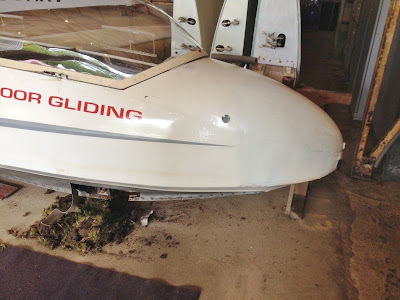 We then had the bad news that, the night before Roger was checking over the gilder to get things ready and had found some trailer rash on the trailing edge that may have happened on the previous retrieve at the ICL the week before. 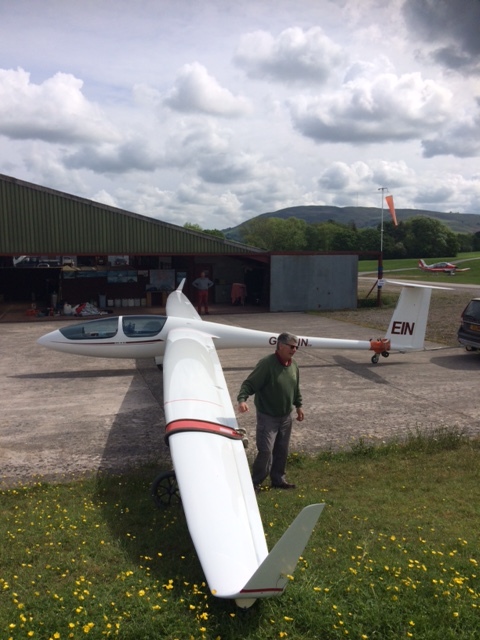 Roger A had dropped off the K6 to Talgarth on the way, to get it checked out to be safe. Good job as it did require some work but not the way to start a course week. 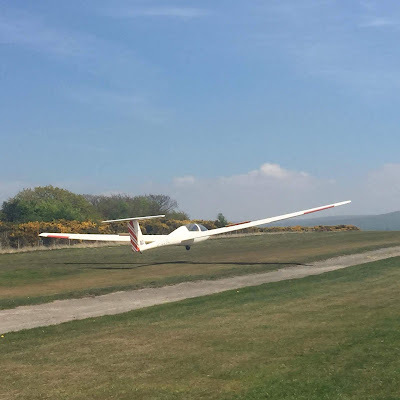 The 1st day of the course set the tone, lecture at 930am with a task to be set if soarable, (for the clubs idea of soarable please read 80% of launches don't need a relight) The rest of you crack on with the task. After checking the NOTAMS , Met and task briefing, the flying gets underway about lunchtime. 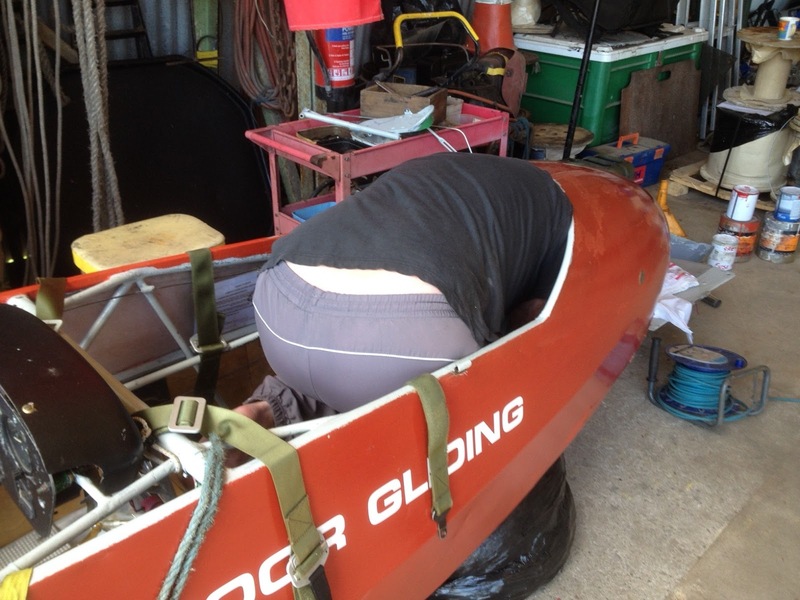 2-Adrian was set his 50km to Sleap and land for a road retrieve. All was well on our task with a good pace down the first leg, but we had left near the back of the pack and the forecast showers arrived at the first turn point the same time as we did!!! The trace makes it look better than it felt. Let our own separate battles with the weather commence, I elected to only go within 3km of the TP and glide out to higher ground to look for a much needed climb, Roger G was brave for the third time in two days and pushed around the TP then ran to the sun ( west of Wrexham ) but by the time he got there he was too low to make use of it and stuck the ASW20 into field with full landing flap. Later when I got to the field for the retrieve ,it was a little hard to work out what direction the approach had been due to how quickly the glider had descended and stopped in the long grass (impressive). My battle after running away from the massive rain shower was to get a climb and work my way towards Cowen. 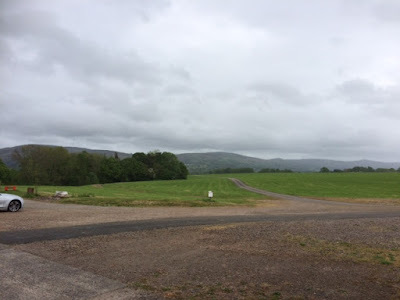 About Llangollen I got a call from Roger G with the instructions by text with where he had landed, so I cut the day short and headed back as I had no idea how long a retrieve in the mountains north wales would take. In the event it was an hour each way and a great retrieve. 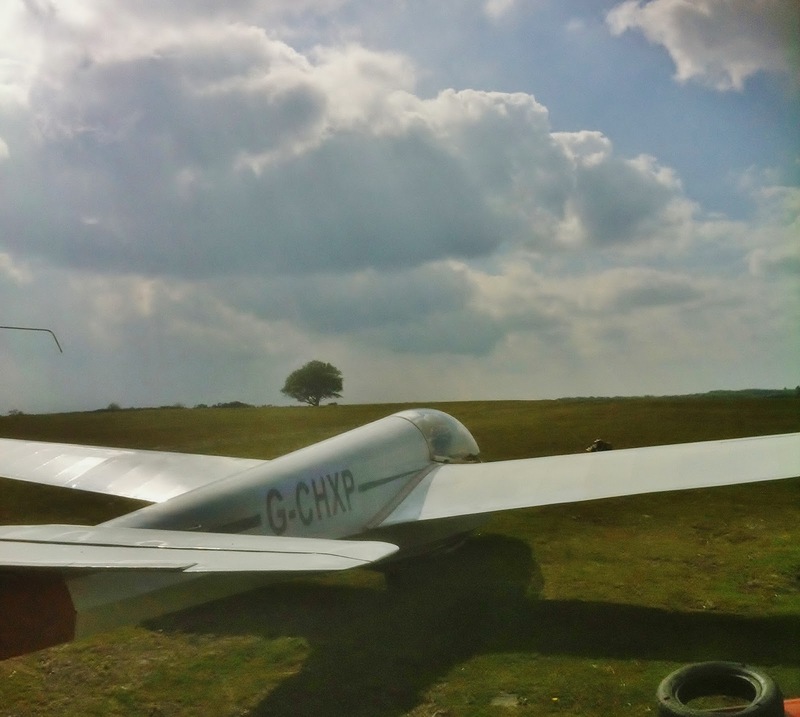 Cut to Roger A , after landing in the arcus , and completing the task he then had the call, Adrian was down safe in a field about 35km away. The glider access was around difficult terrain to say the least and through 4 fields. We then had three days of poor weather but the lectures made up for it and the knowledge will be put to good use, if we can remember it all. 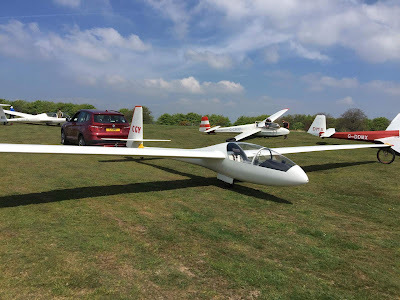 It was then Thursday already, Adrian got a cross country flight in Rod Witters ASG32Mi, an amazing experience on a day when we local soared Rod and Adrian did a quick 200km...... an amazing glider. The instruments sounded better than our singing. Add to this a few meals in with good friends and mix in some pub food with the locals. Great views. What more do you need. Friday was more of the same but Roger G got the honours in the ASG32Mi with Rod. 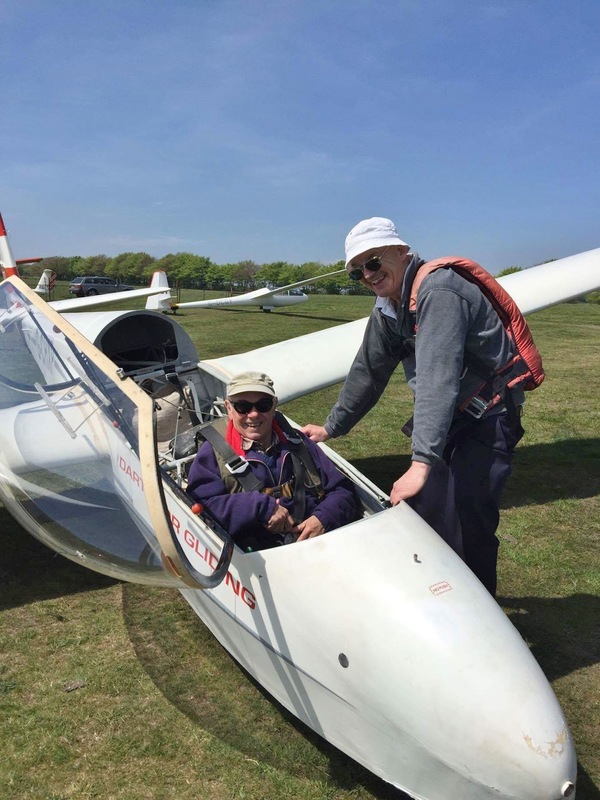 Roger A had got the best he could from the course without a glider and headed home. The forecast was for low cloud and more Dartmoor drizzle and once again the airfield was a tad wet with torrents of water greeting members as they arrived at the gate. Phil Hardwick, Ged Neviskey, Steve Raine, Dave Bourchier, Leith and Robin Wilson tackled the intricate task of repairing the David Brown tractor PTO gear box. 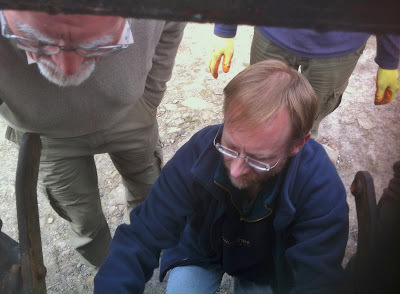 This was well underway when I and Mike Gadd turned up and helpfully watched. Hi tech engineering took place with delicate taps of lump hammers and other tools I couldn't identify. Unfortunately a very brittle circlip broke on removal so I volunteered to do something useful and go and get another one. How hard could it be? 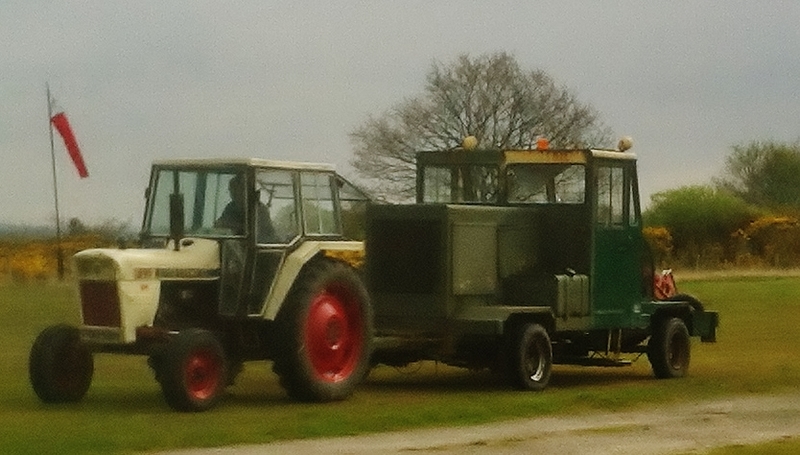 I set off with the only other example from the tractor. After visiting 6 different establishments, all of whom said, 'sorry mate I haven't got anything like that try the place up the road' and then receiving a phone call from Steve Raine asking if I was ever coming back I had to admit defeat and return with the one good circlip so the PTO box could be put back, albeit with one circlip missing. I have to say how lucky we are that we have so many technically proficient members, where would we be without you guys. 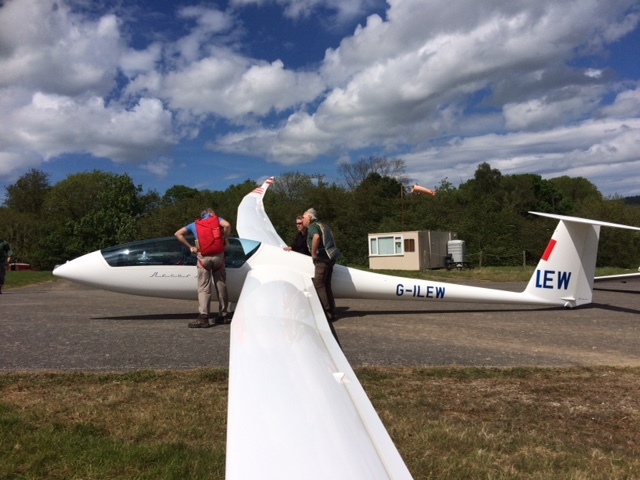 With a willing and eager crew getting the gliders out at 8am, we could have been flying until well past 6pm, if the weather had behaved as forecast (wind SW’ly 20 kts). In the event, however, you had to be either myopic or very broad-minded to accept that the windsock was showing ‘south-westerly’ (when in fact the wind was coming up from the coast ie. southerly). 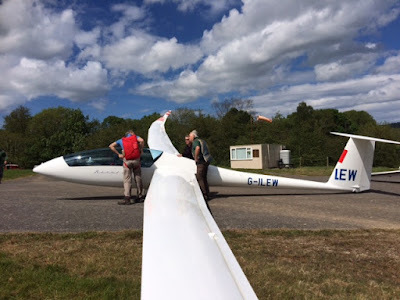 That it freshened as the sun got to work on the ground only exacerbated things, gusting over 20 kts and eventually causing us to ‘stack’ by mid-afternoon, which obviously was ‘sub-optimal’ for those who had yet to fly. How dark?? That dark! 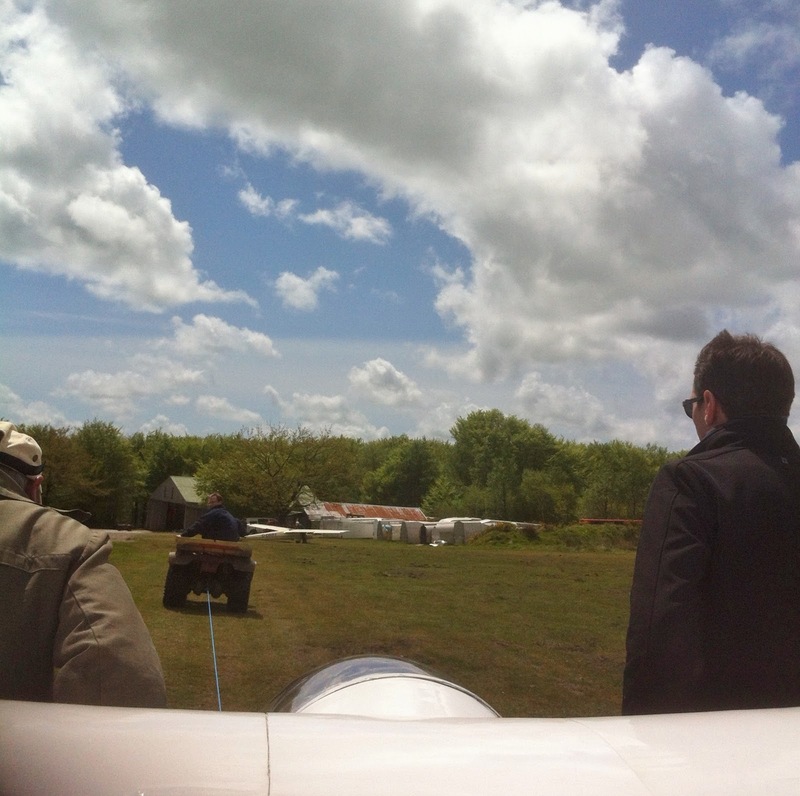 We watch as a shower skirts the airfield. That is not to say that nothing was achieved; some significant events occurred over the course of the 10 launches we made. Chief among these was the consolidation of her initial experience at the club for Charlotte Duffy, Paula Howarth’s niece, who was by no means perturbed and aims to return as soon as she is able. We also managed to get Chris Owen back in to the K-8 (following a requisite number of launch failures in the K-13) and, once the very dark shower pictured here had left the vicinity of the airfield, even squeezed in a couple of soaring flights before the crosswind became too fierce. These included Allan Holland (of course) who endured 61 minutes in ‘moderately’ turbulent conditions reporting back that thermal cores were very small, that he had to spend a lot of time (speed and height) pushing upwind in the K-8 and that his best climb, from 1,200ft to 2,000ft, was made wings level in the blue upwind of the clouds. Well done, Allan! Our other soarer was Ed Borlase who, as a pre-solo pilot, did extremely well to keep the K-13 under control (in ‘the washer’) between 900-1,200ft. Allan Holland in the K-8 seen from the K-13. Ed Borlase soaring (in ‘the washer’) at 1,000ft in the K-13. The rasp forecast for the day looked good and with the sun shining in the early morning it looked good for a day of soaring. As a result a good number of members turned up and after yet another change of ends we started flying. 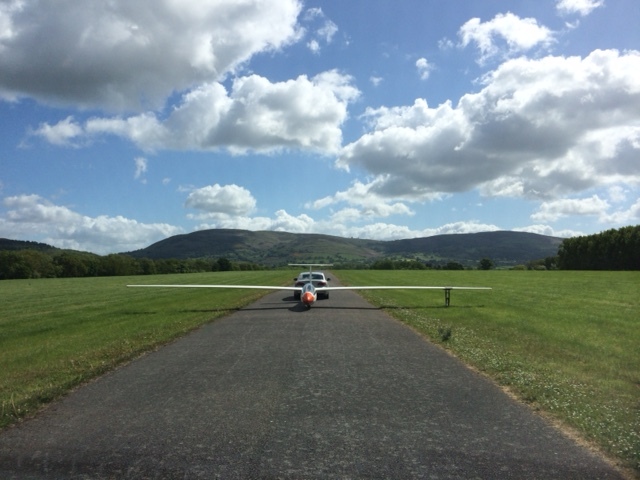 Flights were short though with pilots reporting some thermic activity but difficult to centre in with lots of sink around. 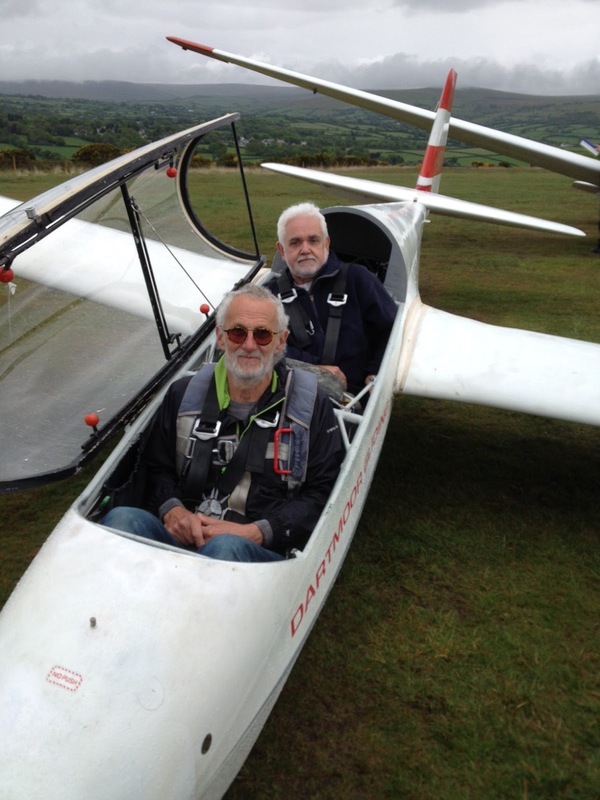 Fred marks managed a good flight with Peter Dauny our visitor from Jersey. 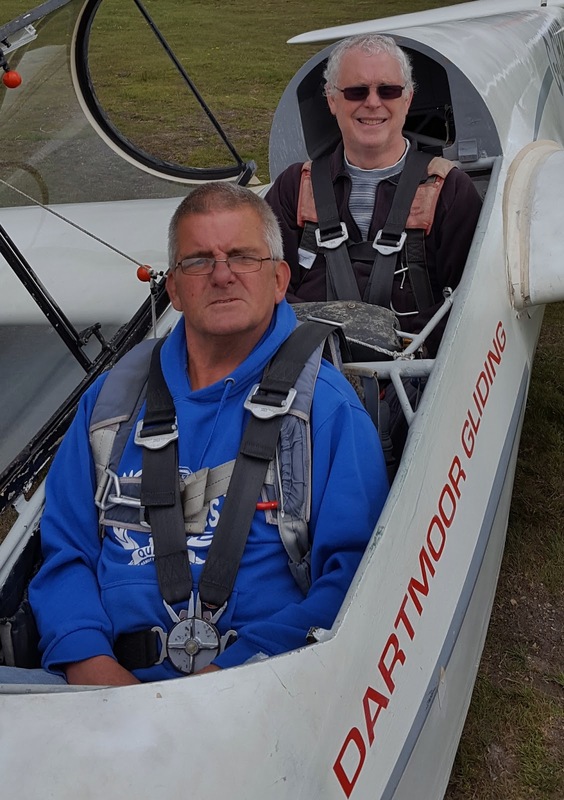 They managed a very creditable 18 mins when everyone else was back on the ground in under 10 mins. Other visitors were Andrew Davis and Jack Dinham. 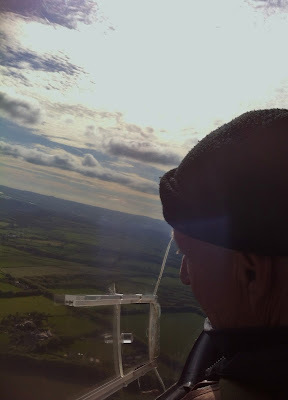 Unfortunately just as the thermals started to pick up we had 3 cable breaks in a row and so we stopped flying to replace the cables with the new cables which luckily had just arrived. 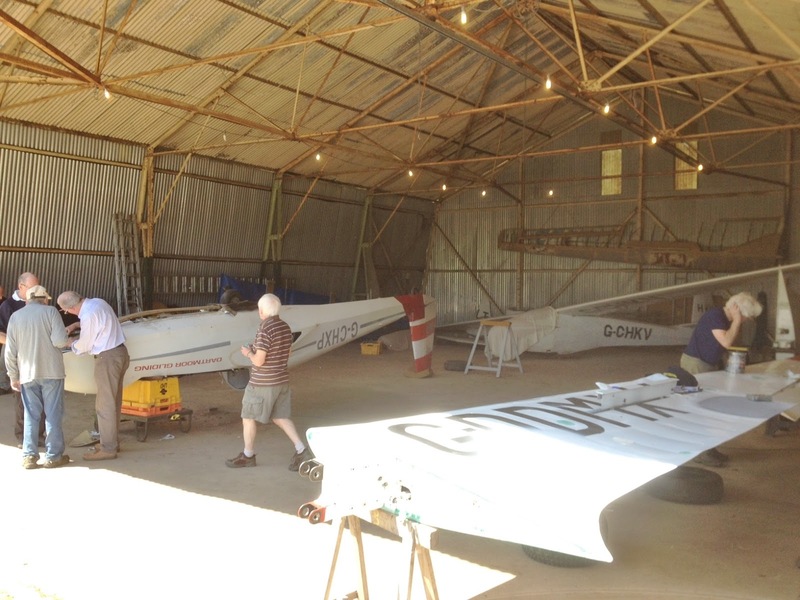 All hands to the task, we managed to change them and start flying again in under 2 hours. 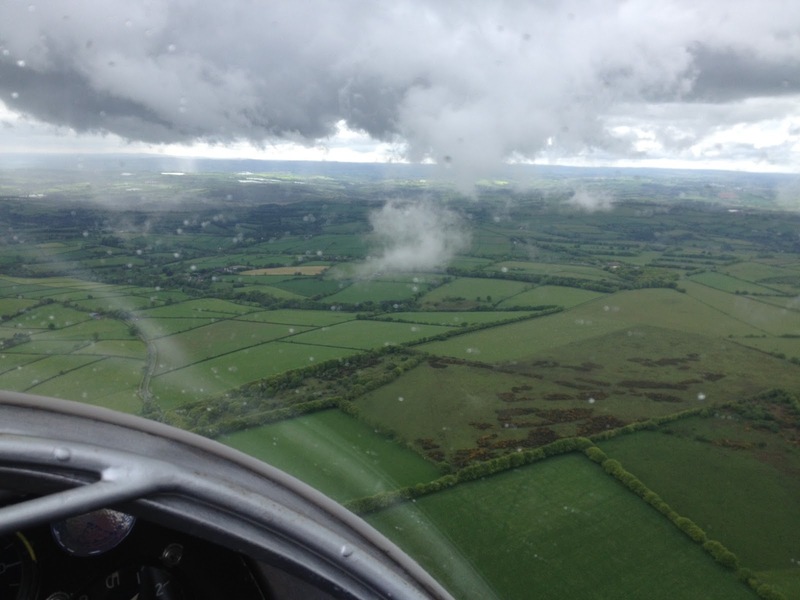 So around 4 ish we started flying again but still those elusive thermals teased us. By now a very blue sky with no cumulus clouds to guide us and getting late in the day a few stragglers stayed on in the hope of finding blue thermals. Around 5 pm blue thermals made their presence known and the late shift partied in the sky. Steve Fletcher getting the best flight of the day in the open cirrus of 55 mins. A big thanks go to Barry who winched most of the day, Colin for taking over from him and especially to Heather who cleaned the club house, drove the retrieve all day and worked like a Trojan helping to remove the old cables by pulling them to the side of the airfield. Thankyou Heather. 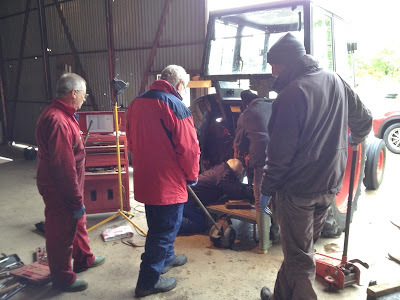 Nobbs and Barry Green attempt to figure out the tractor’s hydraulics. The winch successfully arrives a the west end drawn by the new DB tractor. 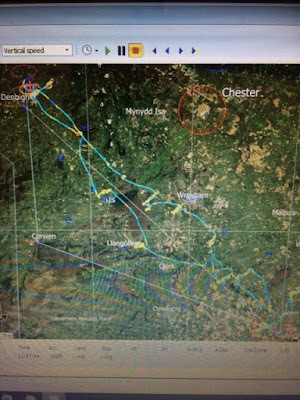 With that 'gremlin' dispensed with, we set about aligning the field to a westabout operation, albeit the windspeed was forecast to be low, of which more later. 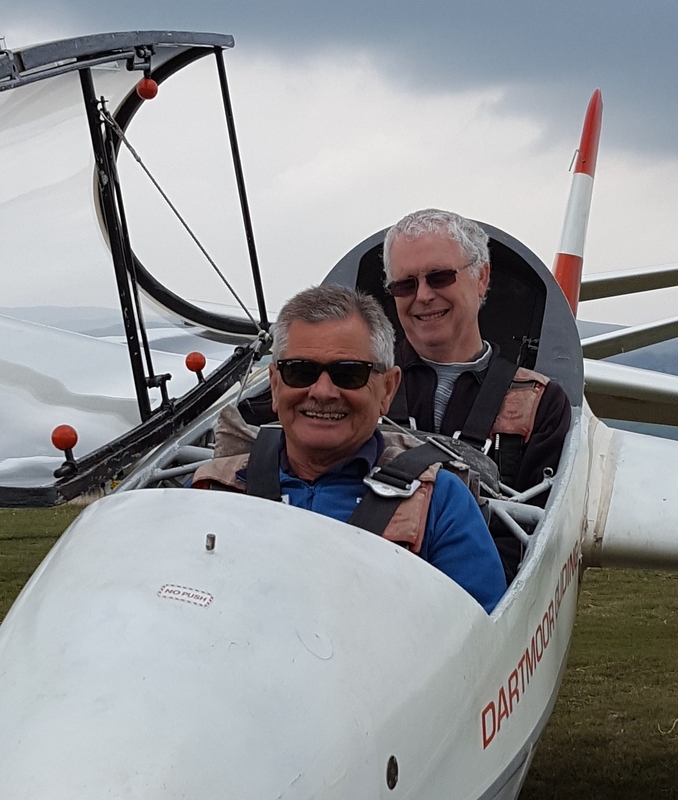 Early arrivals included One Day Course student Peter Spencer who, despite having endured a day in the clubhouse a couple of months ago, nevertheless returned to fly with Pete Howarth (6 launches, one of 25 mins), learning how to operate all three controls together. Today’s One Day Course student was Peter Spencer, from Wells in Somerset. Pete also hosted visitors Tony Jago and Michael Boon: Tony's family occupying all know seat and floor space in the Land Rover Discovery to and from the launch point. Visitor Tony Jago was accompanied by three generations of his family. Afternoon visitor Michael Boon flew with Peter Howarth. But what of the conditions? Well the watchword was fly what you see, not what was forecast... The day was initially much cloudier and the lower atmosphere much more moist than predicted by RASP, light airs settling to a gentle SW’ly before lunch. The wind then veered NW and freshened, backed to W before finally settling on SW again in the mid-afternoon. 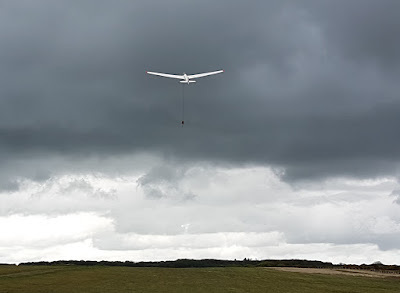 It was only then, with drier air, a better defined horizon and a whiter shade of grey clouds, that we were able to exploit the conditions: in fact in excess of 10 soaring flights were logged (10-49mins, 3 in excess of the half-hour) but none earlier than 3:45pm, so it was worth hanging on for. HXP about to launch mid-afternoon into a promising sky. On the slow coach line of the grid trainees/check flight artistes John Knight, Joe Nobbs, Dave Downton, Jeff Cragg and Chris Owen not only had the thermic conditions at their disposal but also those of a demonic instructor, determined to ensure that they could survive a cable break, at any height..! 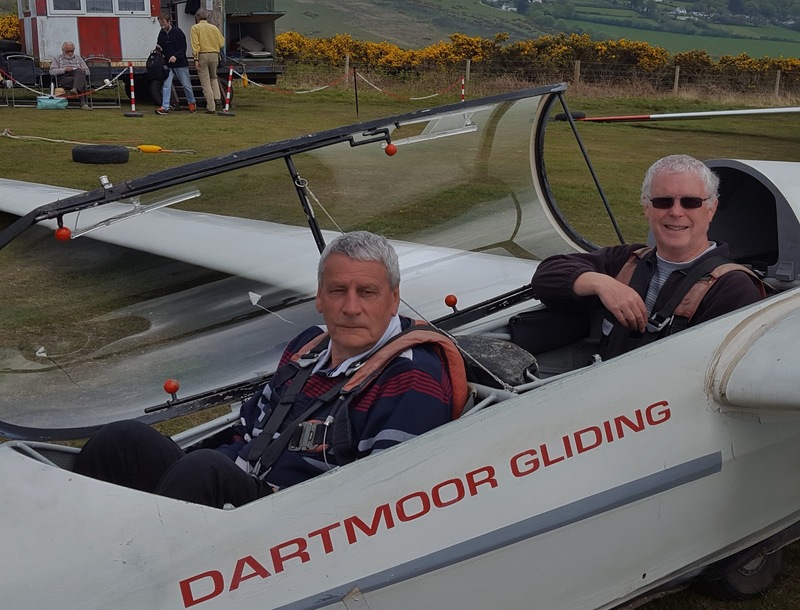 Fast track pilots Alan Carter (SF-27), Steve Fletcher (Open Cirrus - 36 mins), Adrian Irwin (Zugvögel), Leith Whittington (Dart 17R) and Paula Howarth (K-8 - 43 mins..!) occupied the second line of the grid, where pride of place was surely taken by Mike Bennett, who not only converted to the K-8 for the first time but managed 13 mins soaring on his second flight (both landings requiring some quick thinking, 'over the top' recoveries...). Well done, Mike! Mike Bennett about to fly the K-8 for his the time. Thanks must most sincerely go to Barry Green, Colin Boyd, Dave Downton and Mike Bennett for winching, and to Heather Horswill for driving retrieve and dust into the Dyson in the clubhouse. 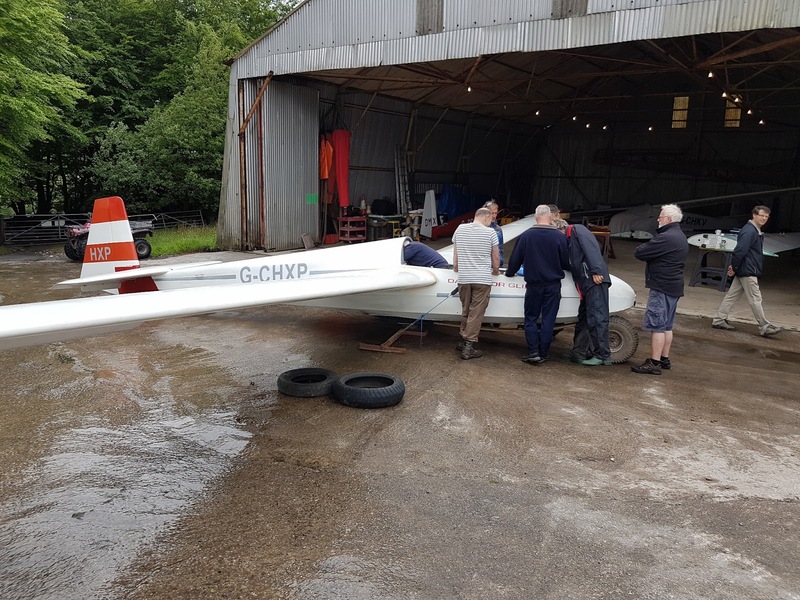 Thanks also go to those who assisted with transporting our guests, maintaining the launch point, and most helpfully pointing out that nothing was happening when I raised/lowered levers in the tractor at the start of the day..!